Sitting. It’s not something I do well. When I was young, my Dad nicknamed me The Runner, because I couldn’t sit still. I was always on the go, running here, there, everywhere—in his car, on my feet, and in my mind. Albatross constantly teach us something. They’ve taught us about energy-efficient flying. They’ve taught us about plastic in our oceans. They’re teaching me about sitting—how to be peaceful and patient, to understand the phrase, “all in good time.” It takes 60-some days for an albatross chick to develop inside its egg and hatch. During that entire time, both parents take turns sitting on their nest—some shifts lasting as long as three weeks—while their mate forages at sea. The majestic seabird with a six-and-a-half-foot wingspan is also teaching me something about momentum. Albatross slice through storms the way a hot knife slips through butter. Albatross don’t just exhibit calm in the storm, they harness the energy of storms for their own, sailing along waves with little expenditure of effort. Some might call this being in the flow. That’s another skill at which I hope to become more proficient. Hob Osterlund: Author + Photographer + Albatross Ambassador = Hobatross. When Hob was 10 years old, her mother died of breast cancer. As children do, Hob shouldered the guilt of her mother’s death on her young shoulders, somehow thinking it was her own fault. After moving to Hawaii, Hob met her first Laysan albatross and was instantly smitten. Shortly after, while watching an energetic group of albatross performing some of the nearly two dozen courtship displays, another albatross approached, intent on joining the dance. Albatross exhibit many admirable characteristics—patience, momentum, loyalty, for example. Another is determination. This albatross was so focused on her destination—the dance party—that she breezed right past Hob, stepping on Hob’s foot to reach her destination. Hob wrote her book. She formed Kauai Albatross Network, dedicated to creating safe nesting habitat for Laysan albatross on Kauai. She worked with Cornell Lab of Ornithology to install a live streaming webcam for all the world to watch the hatching of an albatross chick and its five-month growth to fledging. This season marks the fifth year for the AlbatrossCam. Now, Hob's latest project is a short film, currently titled Kalama’s Journey, following the life of last season’s star of the AlbatrossCam. For all this and her steady, supportive friendship, I’m excited to donate twenty percent of Albatography’s net proceeds for January 2018 to Kauai Albatross Network. 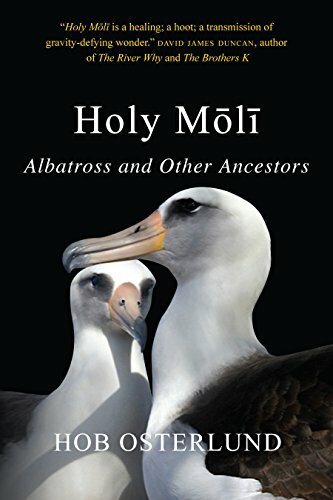 Hob calls the miracles that albatross seem to create around them, “Mōlī Magic.” Mōlī is the Hawaiian word for the beatific species we know as Laysan albatross. Right now, Laysan albatross are still sitting on the egg in their nest cups, more than halfway through their two-month-long incubation. In a few short weeks, their patience will be rewarded with the greatest miracle of all: life. Stay tuned. enter the magical world of mōli. 20% of Albatography's January proceeds go to Kauai Albatross Network.